This month topic is Transport Hubs, and it doesn't matter if it's cargo, pax, mail or any combination of the later. New & Old Central Station. This is the main railway station of a big city. It was built for the first railway line and had a passenger building and a clock tower. It was very beautiful but, decades after, it became too small, so some new underground tracks were built to increase the capacity and lengthen the rail line into the city. However, the high speed arrived in the nineties, and new platforms were built. The old freight station was moved nearby to free space for the new passenger terminal. A new hall, a signal control centre, a post office and several bus platforms were built to create a transport hub. Several bussiness were made around the great station, like several hotels, a fast food restaurant or a high tower. In fact, the World Transport Organization office is now being built in this area. It's a created scenario (not a real game), from pak 128, with Spanish Addons..
November? I must be time travelling. I meant October, sorry for confusion. Long ago, this formerly small town was served by a regional line to the closest major city of the map. 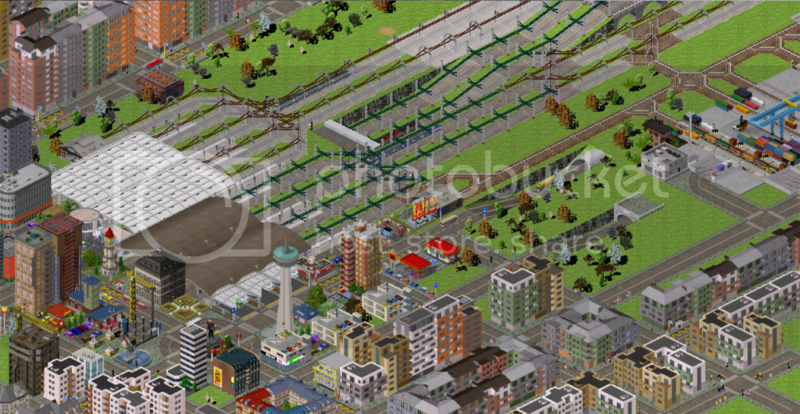 Now, this line was converted into a high speed line, the station is connected to the three biggest cities of the map. A regional station was added under the high speed station, connecting the town to the rest of the major cities. Hmm... All I see so far is nice, polished pak128 screenshots with fancy half-heights and climates... Let's break it up a bit! So let me give a little background for the image. It's taken in my first big simutrans game, back in the classical version 88.10.5. When I first got the game it had taken me quite long to figure out how to even set up a single line, and so I didn't ever bother learning signals properly. That is why there are so many platforms: one for almost every train. Some lines had signals, but as soon as something went wrong I demolished the signals and let the trains run freely (through each other, that is). A big contributor to my difficulties might have been the incomplete translation. I remember seeing many error messages in German, and I couldn't use any tutorials or read the forum as my English was on beginner's level at the time. The reason the station grew that big is partially because my map was large and so there were many pharmacies, but only one chemical factory and pharmaceutical factory to supply them. This made it originally my main hub and was later on a natural passenger hub as well. The passengers got out of control fast and now there are over 1.6 million people waiting. Interestingly, the population of the region is slightly below one million. Once upon a time this town was famour for its temple in the suburbs. So a train line from the capital at the coast was build. Since there were some other towns close by, it evolved evolved into a major transport hub; despite being located so far away from the coast. The old mainline is nowadays only used for freight since the new Shinkansen finally arrived. And now, as the end of a Shinkansen line, town development is really starting, with a brand new covered pedestrian shopping zone downtown next to the station. (I have a nicer quality source image too). Send it. pak.Japan deserves it.